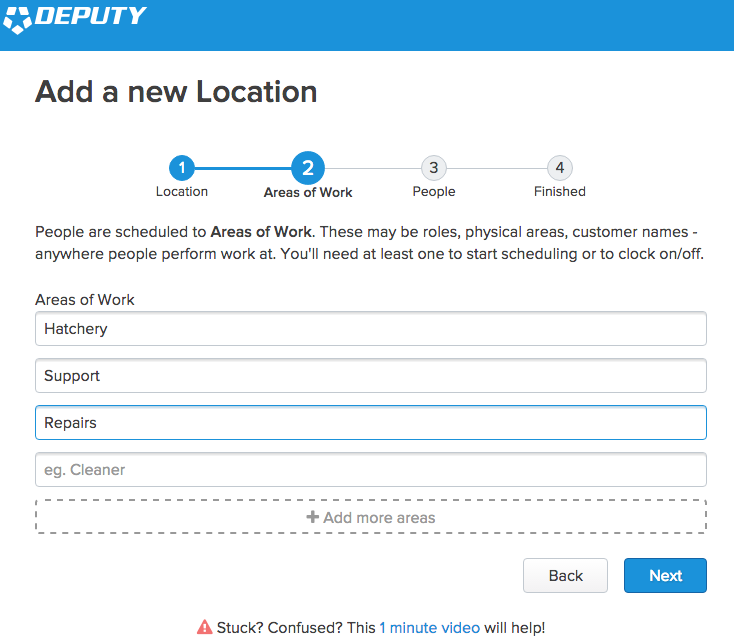 This guide shows some helpful tips to when you first create a business in Deputy. Please note that you must have a valid email address to create an organisation. If you have already used your email address to sign up as an employee, you may create an organisation here. If you have already signed up for a trial with the same email address, you will be unable to begin another. You may sign up to Deputy from our homepage, by clicking 'Start Free Trial' at the top of the page. 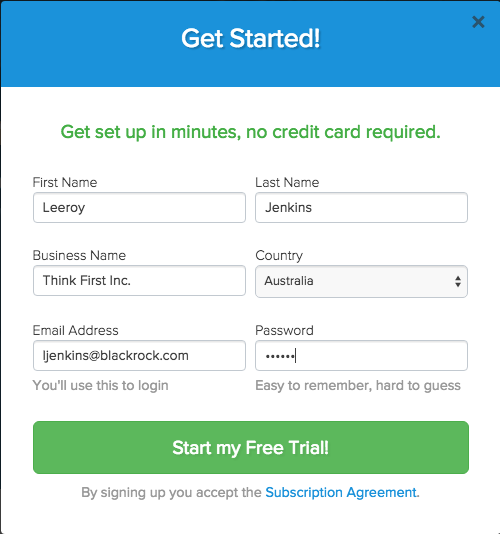 When you first sign up you will be asked to fill in a number of fields, including your name, business name, email address, country, and unique URL. Each field must be filled to proceed. Once they are filled, please click "Sign Up". After signing up, you will be asked to create your first location. This does not necessarily need to be your HQ. To create your first location, you will need to assign it a name and an address as shown. If you prefer, you may click the map to assign your address rather than typing it. When you are satisfied, please click "Next". You may create any number of new locations or areas as necessary. For more information, please read our article. On the next page, you will be asked to create your first Scheduling Areas. The Scheduling Areas are used to separate your employees into the categories most useful to you, whether these be areas of work, customer names, or occupations in themselves. You will schedule your employees to these areas based on your work setup. You may create as many as you need in each location. When you create a new location you will be asked to add any rostering areas; if you need to add others later you may do so in each location's Settings, under "Areas". 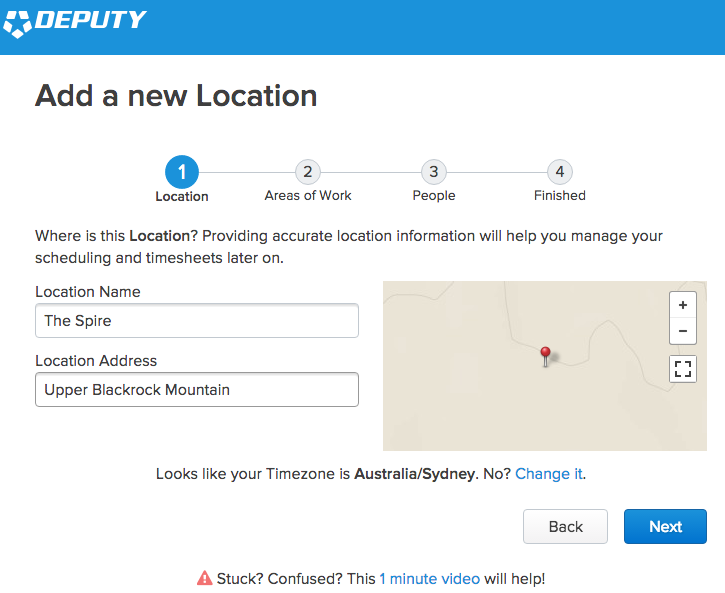 After creating the location, you may add training to rostering areas to later apply to your employees. Adding training to an area restricts which employees are recommended to work there. If your bar has an RSA training requirement, then only staff who have an RSA will be recommended to work there. Please see here for more information on training. After you create your first location, you will be asked to add team members to your organisation. When adding these team members, it is not strictly necessary to enter their email addresses and phone numbers, however without at least an email address your employees will not be able to create an account with your organisation, meaning that they will not be able to login via Deputy.com, or use the mobile app. For this reason, we recommend that your employees have an email address attached to their account. If your employees do not have a mobile, then you cannot use any SMS functions (Kiosk PIN retrieval, shift confirmation, shift publishing). If you do not want to invite your staff to the team yet, please toggle off the "Send Invitation Email" option. This will prevent your employees logging in online unless you send the invitation. If your employees do not have an email address, you can create an alias email address for them in Gmail. This is achieved by adding a "+" symbol and some letters or numbers after your email address. For example, if your email address was homerestoration@gmail.com, you could create homerestoration+admin@gmail.com, or homerestoration+23@gmail.com. You may use whatever you like, as long as it is unique. All emails sent to an alias will be redirected to the original inbox, meaning that you will not be able to send your employees their shifts via email. However, this means that if you attach an alias email when you add an employee, the invitation email will be redirected to you, meaning that you can create accounts for your employees and set their passwords. You may then pass those details to the relevant staff members, allowing them access to Deputy. As an added benefit, this also allows your employees to download and use the app with the alias. 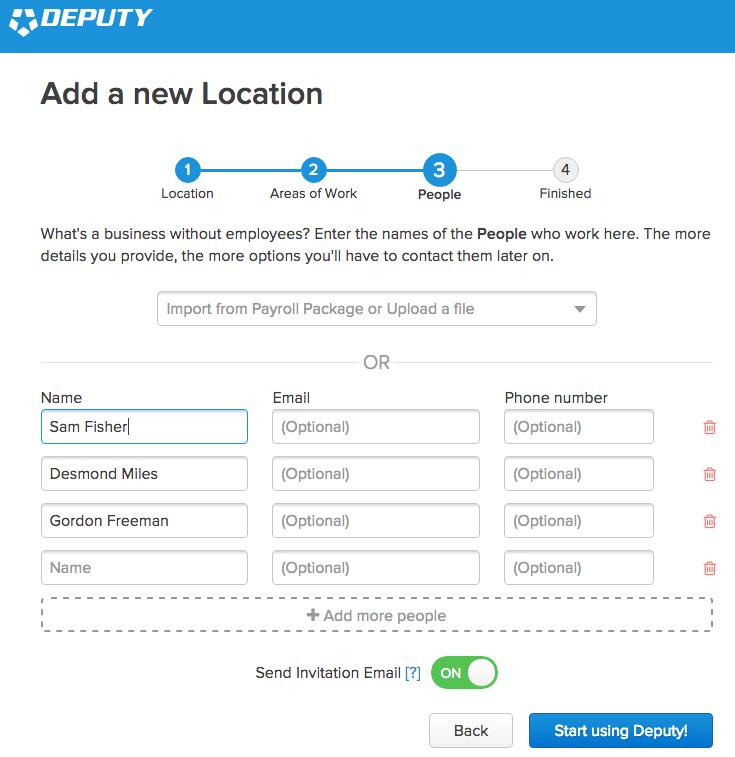 You may later add more employees to Deputy from the People page. You may also import or upload a file containing employee details from your payroll provider, or an Excel file. For further information, please see our article. Once you have added a location, rostering areas and employees, you will be ready to start scheduling your employees. Before you begin, we recommend that you customise your settings first. You can access the Settings by going to your Locations tab, then click "Edit Settings" to the right of your location. Next, click "Scheduling" on the left. In your Scheduling settings, you may set your opening and closing times, default shift and meal break length, confirmation settings, and the starting day of your week. When you have finished making changes, please click "Save Changes". Scheduling functions in Deputy are quite extensive, so as a result, the subject has its own article. We recommend reading it to make the best use of everything available for you. The Deputy Kiosk/Time Clock will allow you to create and maintain a dedicated time clock service on your premises. You can download the tablet app from your respective operating system's stores (iOS App Store, Android Play Store). Once the tablet is set-up in your location, you may not use it in another location unless you reset it, however, you may have multiple tablets in one location if necessary. Please see here for information on starting a shift with the Kiosk/Time Clock. With Deputy, it is possible to integrate your sales data with your projected wages in real-time, allowing you to make your business decisions based on reliable, up to date information. On the roster, you may access the graph by clicking the Graph button, which will display the current data. Deputy allows you to integrate directly with a number of POS. For instructions on how to link your POS system with Deputy, please see our article. You may also enter sales data for past weeks if you wish to. In future weeks on your roster, you will see yellow lines displayed on the graph. This is your predicted sales, calculated as an average based on data from previous weeks.